Analyse Sūra al-‘Qalam (Chapter 68) showing the structure and organic unity of the sūra. Exploring organic unities and structures within sūras is a new phenomenon, as I believe the early Muslims (ṣaḥāba and tābi’īn), when analysing verses and sūras could ‘organically unify and structure each verse with the lived experience of Prophet Muhammad. Hence they sought no need of understanding structures and organic unities. However, now the need intensifies, as even on grassroots level yearn to understand the organic unity of the Sacred Text. I will therefore analyse and experiment with Amin Ahsan Islahi’s idea of ’amūd, by using his basic principles alongside Marwān Nūr al-dīn Sawār’s innovative notion of colour coding verses grouped under specific contexts. I will also aid my analysis with illustrations and diagrams marked on pages 5 and 6. ‘(1) Each Qur’ānic sūrah has a dominant idea, called the axis of the sūrah, around which all the verses of that sūrah revolve. Thus no verse, or no group of verses, stands alone but has a direct relation with the axis of the sūrah and is part of the coherent scheme of the sūrah. (2) The sūrahs of the Qur’ān exist in pairs, the two sūrahs of any pair being complementary to each other and, together constituting a unit. There are a few exceptions, however. The first sūrah, Fatihah, does not have a compliment, because it is a kind of preface to the whole of the Qur’ān. All the other exceptions too are not exceptions in the real sense of the word since each of them is an appendix to one or the other sūrah. (3) The 114 sūrahs of the Qur’ān fall into seven groups. The first group comes to an end at sūrah 5, the second at sūrah 9, the third at sūrah 24, the fourth at sūrah 33, the fifth at sūrah 49, the sixth at sūrah 66, and the seventh at sūrah 114. 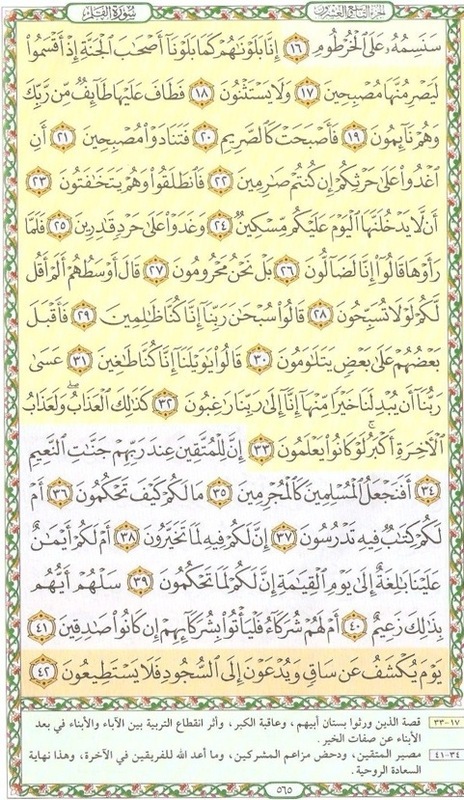 Each group contains one or more Makkan sūrahs followed by one or more Madīnan sūrahs of the same cast. Like individual sūrahs or each pair of sūrahs, each group has a central theme which runs through all its sūrahs, knitting them into a distinct body. In each group, the themes of the other groups also occur but as subsidiary themes. (4) Each group logically leads to the next, and thus all the groups become variations on the basic theme of the Qur’ān, which is: ‘Allah’s call to man to adopt the right path’. Now, keeping in mind Mir’s concern regarding the difference between ‘connectedness’ and ‘organic unity’, ‘a connection, howsoever weird and farfetched, can be established between any two objects of the universe. But organic unity implies the presence of a harmonious interrelationship between the components of a body or entity which produces a unified whole, a whole which is over and above the sum total or the components of and has worth and meaning in itself’, I have sought to depict Islahi’s idea through a diagram (see fig. 1.1, p.5) to then project this notion upon each sūrah and in this case, particularly sūra al-qalam. I will explore, through Islahi’s tadabbr-e-qur’ān, the sūrah’s organic unity within itself; with its pair; within it’s group amongst the seven other groups and finally its unity within the Qur’ān. The state was such after the revelation of these suwar that Arabia changed in its entirety: one was either for this call, or on the contrary ardently opposed to it. 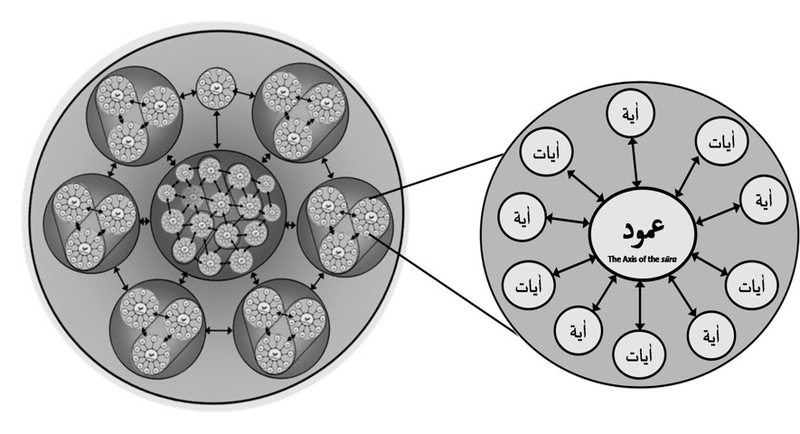 Interconnection (rabṭ): The previous sūra (al-mulk) covers the narratives of munkirīn-e-tawḥīd (those opposed to monotheism), on the contrary this sūra (al-qalam) deals with ṭā’inīn fī al-nubuwwa (those who reproach and taunt the Prophethood of Muhammadؑ), and because denying Prophethood is kufr, hence the earthly (dunyawiyya) and heavenly (ukhrawiyya) punishments have been the axis of certain verses. Hence, it is also possible to see how both the exegetes explain a similar notion from differing perspectives, as for Islahi, he views the axis of the sūra to be indhār, whereas for Thānwī a response to those who reject notions of tawḥīd and nubuwwa. Hence, I will now experiment with Islahi’s basic concept to structure sūra al-qalam and explore whether the āyāt flow amid the ’amūd – indhār, as apposed to the atomistic approaches. 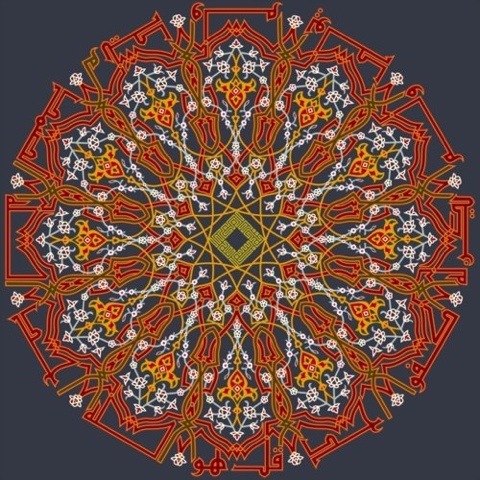 In doing so I will now introduce an innovative idea on grassroots level edited and researched by Marwān Nūr al-dīn Sawār and his team, who have produced a ‘colour coded verse contextualised Qur’ān’, in which all the verses of the same context are colour coded together and a further specific verse based explanation of the text is given at the foot of the page (see Fig. 2.1 on p. 6). Sawār forms six groups of verses in this sūra as shown in Fig. 2.0 : (1) verses 1-4; (2) verses 5-16; (3) 17-33; (4) 34-41; (5) 42-47; and (6) 48-52. Keeping in mind Sawār’s categorization I will now merge Islahi’ṣ idea and axis (’umūd). Verses’ 1-4, I opine, to be the Qur’ān’s response to the allegations laid down by the Quraysh, who were responding to the indhār of the Prophet by declaring him majnūn. These set of verses in their response play a major role in reassuring the Prophet of his ‘ajr and status, and in doing so hint towards the endeavour of previous Prophets, especially Yūnus (Jonah). Despite the mainstream cognisance of ḥurūf al-muqaṭṭa’āt, that their true meaning is only in the mind of the Author, to understand the relationship of nūn with the ’umūd Ḥamīd al-dīn Farāhī presents sūra al-nūn in support of his theory regarding these letters: “the letter nūn still denotes its ancient meaning of fish. In this sūra, the Prophet Jonah (sws) has been addressed as ṣāḥib al-ḥūt (he is also addressed as ṣaḥib al-nūn in sūra 21:87) that is he who is swallowed by a whale. Farahi opines that it is because of this reference that the sūra is called ‘nūn’. He goes on to say that if one keeps in consideration the example given above, it is quite likely that the abbreviated letters by which other Surahs commence are placed at the beginning of the Surahs to symbolize a relation between the topics of a particular sūra and their own ancient connotations”. Therefore the Prophet has been reminded at the very beginning of the sūra that patience is incumbent once the call (indhār) has been given, by reminding him of the incident of Yūnus in the whale (nūn) which is linked to verse 48 – and be not like the man of the fish. Finally, according to Islahi the purpose of the oath was to give a three fold response to the Quryash; (1) rejection of their claim of the Prophet’s junūn; (2) rejection of their claim that the Prophet’s endeavour is for a limited period, and it would soon fade away with the turning pages of history; and finally (3) that the Prophet is the beholder of high character, therefore the Quraysh call upon themselves grave torment. All purposes for the oath are linked to the axis (indhār) as the response of the Quraysh was a direct result of the Prophet’s indhār to them. This first set of verses (1-4) then move onto the second, verses 5-16. I believe group 2 to be a follow on of the reassurance to the Prophet by instructing him not to give in and follow or become sympathetic in his call (indhār) (وَدُّواْ لَوْ تُدْهِنُ فَيُدْهِنُونَ) towards such a people, whom the Qur’ān describes as al-mukadhibīn, ḥallāf mahīn, hammāz etc. Thereafter, the theme moves onto a parable of the people of the garden (Group 3: verses 17 – 33). I view this parable from two distinct perspectives, both of which are intertwined with the ’amūd. The first being that of Thānwī mentioned earlier, the earthly (dunyawiyya) torment upon those who reproach nubuwwa, hence reject the indhār foretold to them. The second perspective, I opine, in the midst of all chaos a kind of glad tiding to the Prophet of an ultimate spread of Islam within the Quraysh. For the former notion the Quraysh are warned to beware of similar consequences to those who had all the wealth and the latter to the Prophet, working on the theme of patience, that the Quraysh will not accept in the initial stage of the indhār, but will ultimately embrace once the power of God can no longer be rejected: similar to the saying of one of them ‘Did I not say to you, ‘why do you not pronounce Allah’s purity?”, they said “we pronounce the purity of our Lord. No doubt, we were wrongdoers” (68:28-29) is reminiscent to the attitude of the Quraysh following the conquest of Makkah. Group 4 of the verses (34-41) sets out an immensely significant ethical principle in Islam: the one who opposes the indhār and on the contrary the one who wholeheartedly accepts it cannot be equal, they will be rewarded accordingly. After illustrating the punishment for those who reject the call, the Qur’ān portrays the awaited rewards for those who take heed of the warning and clearly draws the line, ‘shall We make the obedient like the sinners? What has happened to you? How do you judge? (68:35-36), I believe this also reflects the message of verse 68:9. Group 5 (Verses 42-47) draws vivid images of the resurrection and verse 44 (فَذَرْنِى وَمَن يُكَذِّبُ بِهَـذَا الْحَدِيثِ) could also be taken as clear indication towards the significant unity with the ’amūd. And finally, group 6 (48-52) comes back to what was mentioned earlier: instructing the Prophet to be patient upon his people’s attitude towards the indhār, unlike ṣāḥib al-ḥūt (dhu al-nūn). I would not abandon it (the indhār). Also for a detailed exploration see. Islahi, A. A. (2009). 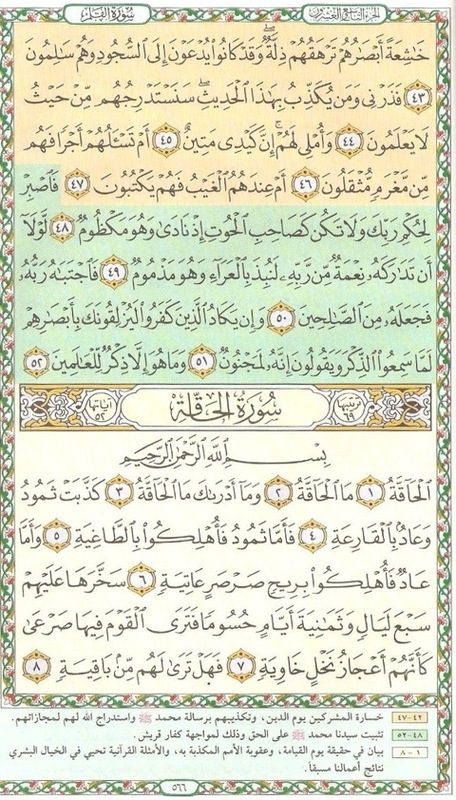 Tadabbur-e-Qur’an ( تدبرِ القران). Vol. 1 , pp. 13-42 [Urdu]. See also Campanini, M. (2010). The Qur’an: Modern Muslim Interpretations. Trans. by Higgitt, C. – Under Chapter IV ‘The Qur’an and Nazm’, pp. 85-88. اِنذار : (انذر) Andhara (prf. 3rd.p.m.sing.IV. ): War ned; Called attention to; Showed the danger to come (Omar, ‘A. M. (2008). Dictionary of the Holy Qur’ān. pp. 557-558) – hence, Indhār would mean ‘warning of an approaching danger’. Thanwi, A. A. (1424 A.H.). Bayanul Qur’ān (بیان القران ). Vol. 3, p. 571. Islahi, A. A. (2009). Tadabbur-e-Qur’ān ( تدبرِ القران). Vol. 8, p.512. Edited and researched by Sawār, M. N (1st ed. 2007). Dār al-Fajr al-Islāmī: Damascus, Syria. Campanini, M. (2010). The Qur’an: Modern Muslim Interpretations. Routledge: London & New York. Ibn Abbas, A. Tanwîr al-Miqbâs min Tafsîr Ibn ‘Abbâs. Mir, M. (1999). ‘Is the Qur’an a Shapeless Book?’. Renaissance, 1999, Volume 9, No. 8. ‘Omar, ‘A. M. (2008). Dictionary of the Holy Qur’ān – (Arabic-English). 5th ed. NOOR Foundation – International Inc: USA and Germany.